Perry Swindle, born George Perry Swindle, was a prominent businessman and employer of Ray City, GA, where he operated a general mercantile store. He was born March 24, 1889, a son of George Emory Swindle and Margaret M. Futch. As a boy, Perry Swindle attended Kings Chapel School, southwest of Ray City. Perry Swindle married Cynthia E. Pafford. The Swindle home was located on the southwest corner of Main Street and the Ray City – Valdosta highway. The Swindle family had neighbors like Dr. Lawson S. Rentz, pharmacist C.O. Terry, businessmen W.H.E. Terry and Arthur Miller, and Mayor J. Lacy Moore, among others. The Swindle children, Helen and Earl Pafford Swindle attended the Ray City School. 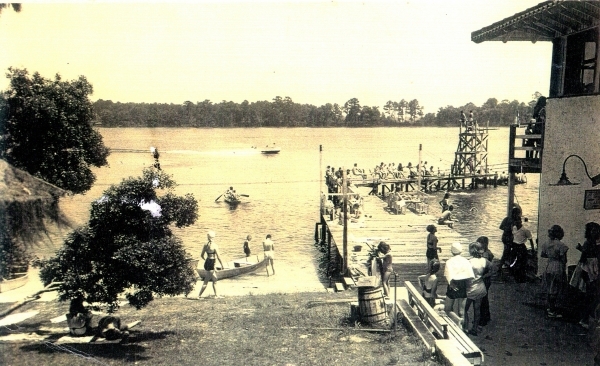 In the 194os Perry Swindle provided an annual field trip for the students of Ray City School, an excursion to the Twin Lakes Resort Pavillion at Lake Park, GA. In 1926 a developer opened the Twin Lake Resort Pavilion on Long Pond at a cost of $5 million, an extreme amount for then. Many South Georgia and North Florida residents remember picnicking and learning to swim and ski there especially during the 1940’s and 1950’s. For 25 cents per student, Perry provided round-trip transportation from Ray City to Twin Lakes for the group of students on the back of his large flat-bed, stake-side farm truck. Students were excused from school for the entire day. They brought their own bag lunches, usually fried chicken or other picnic fare, and spent all day at the park. Students paid an additional 25 cents for admission to the park where there was swimming and other activities. For a small extra charge park patron could rent a swimsuit for the day, or take a trip around the lake in a big in-board motor boat. For at least some Ray City students, the Pavilion was the place where they learned to swim. Indeed, the Twin Lakes field trips provided by Perry Swindle are still fondly recalled.